This article is based on a Wikipedia article and is controlled by version 3.0 of Creative Commons Attribution-ShareAlike (CC-BY-SA). Mars 2020 is a Mars rover mission by NASA's Mars Exploration Program with a planned launch in 2020. The as-yet unnamed Mars 2020 was announced by NASA on 4 December 2012 at the fall meeting of the American Geophysical Union in San Francisco. The rover's design will be derived from the Curiosity rover, but will carry a different scientific payload. Nearly 60 proposals for rover instrumentation were evaluated and, on 31 July 2014, NASA announced the payload for the rover. The rover is planned to be launched in 2020. based on scientific objectives set one year earlier. Precise mission details will be determined by the mission's Science Definition Team. In May 2017, evidence of the earliest known life on land may have been found in 3.48-billion-year-old geyserite, a mineral deposit often found around hot springs and geysers, uncovered in the Pilbara Craton of Western Australia. In September 2013 NASA launched an Announcement of Opportunity for researchers to propose and develop the instruments needed, including a core sample cache. 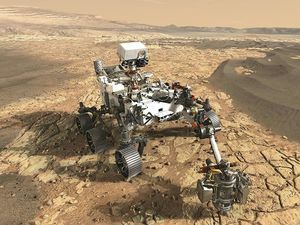 The rover can make measurements and technology demonstrations to help designers of a human expedition understand any hazards posed by Martian dust, and will test technology to produce oxygen (O2) from Martian atmospheric carbon dioxide (CO2). As proposed, the rover will be based on the design of Curiosity. While there will be differences in scientific instruments and the engineering required to support them, the entire landing system (including the sky crane and heat shield) and rover chassis can essentially be recreated without any additional engineering or research. This reduces overall technical risk for the mission, while saving funds and time on development. A Multi-Mission Radioisotope Thermoelectric Generator, left over as a backup part for Curiosity during its construction, will power the rover. The rover mission and launch is estimated to cost about US$2.1 billion. In October 2016, NASA reported using the Xombie rocket to test the Lander Vision System (LVS), as part of the Autonomous Descent and Ascent Powered-flight Testbed (ADAPT) experimental technologies, for the Mars 2020 mission landing. Planetary Instrument for X-Ray Lithochemistry (PIXL), an x-ray fluorescence spectrometer to determine the fine scale elemental composition of Martian surface materials. Radar Imager for Mars' subsurface experiment (RIMFAX), a ground-penetrating radar to image dozens of meters beneath the rover. Mars Environmental Dynamic Analyzer (MEDA), a set of sensors that will provide measurements of temperature, wind speed and direction, pressure, relative humidity and dust size and shape. It would be provided by Spain's Centro de Astrobiología. The Mars Oxygen ISRU Experiment (MOXIE) is an exploration technology investigation that will produce oxygen (O2) from Martian atmospheric carbon dioxide (CO2). This technology could be scaled up in the future for human life support or make rocket fuel for return missions. SuperCam, an instrument that can provide imaging, chemical composition analysis and mineralogy in rocks and regolith from a distance. It is similar to the ChemCam on the Curiosity rover but with four scientific instruments that will allow it to look for biosignatures. Mastcam-Z, a stereoscopic imaging system with the ability to zoom. Scanning Habitable Environments with Raman and Luminescence for Organics and Chemicals (SHERLOC), an ultraviolet Raman spectrometer that uses fine-scale imaging and an ultraviolet (UV) laser to determine fine-scale mineralogy and detect organic compounds. Mars Helicopter Scout (MHS) is a solar powered helicopter drone with a mass of 1kg that could help pinpoint interesting targets for study and plan the best driving route. It has coaxial rotors, a high resolution downward looking camera for navigation, landing, and science surveying of the terrain, and a communication system to relay data to the rover. Microphones will be used during the landing event, while driving, and when collecting samples. 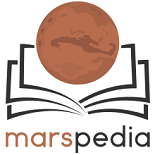 The following locations are the eight landing sites that were under consideration for Mars 2020 previous to the meeting in Pasedena, California Feb 2017. A workshop was held on 8–10 February 2017 in Pasadena, California, to discuss these sites, with the goal of narrowing down the list to 3-4 final sites for further consideration. In reaction to the announcement, California U.S. Representative Adam Schiff came out in support of the Mars rover mission plans, saying that "an upgraded rover with additional instrumentation and capabilities is a logical next step that builds upon now proven landing and surface operations systems." NASA's science chief John Grunsfeld responded that while it could be possible to launch in 2018, "it would be a push." Grunsfeld said a 2018 launch would require certain science investigations be excluded from the rover and that even the 2020 launch target would be "ambitious." Space educator Bill Nye added his support for the planned mission saying, “We don't want to stop what we're doing on Mars because we're closer than ever to answering these questions: Was there life on Mars and stranger still, is there life there now in some extraordinary place that we haven't yet looked at? Mars was once very wet—it had oceans and lakes. Did life start on Mars and get flung into space and we are all descendants of Martian microbes? It's not crazy, and it's worth finding out. It's worth the cost of a cup of coffee per taxpayer every 10 years or 13 years to find out.” Nye also endorsed a Mars sample-return role, saying “The amount of information you can get from a sample returned from Mars is believed to be extraordinarily fantastic and world-changing and worthy." The selection has been criticized for NASA's constant attention to Mars, and neglecting other Solar System destinations in constrained budget times. Contrary to usual NASA practices, the mission was approved for flight before a Science Definition Team (SDT) had been formed to decide on the mission's purpose and goals. This page was last edited on 17 December 2018, at 11:47.